Our “rustic backcountry” campsites unfailingly has beverages and proper stemware. Bring your own stove. The wind grew stronger each successive day. Watch how it lifts the water straight off Lago Nordskogg. There was a bit off a flood on our way out. The local rangers are *very* confident in their pickup trucks. 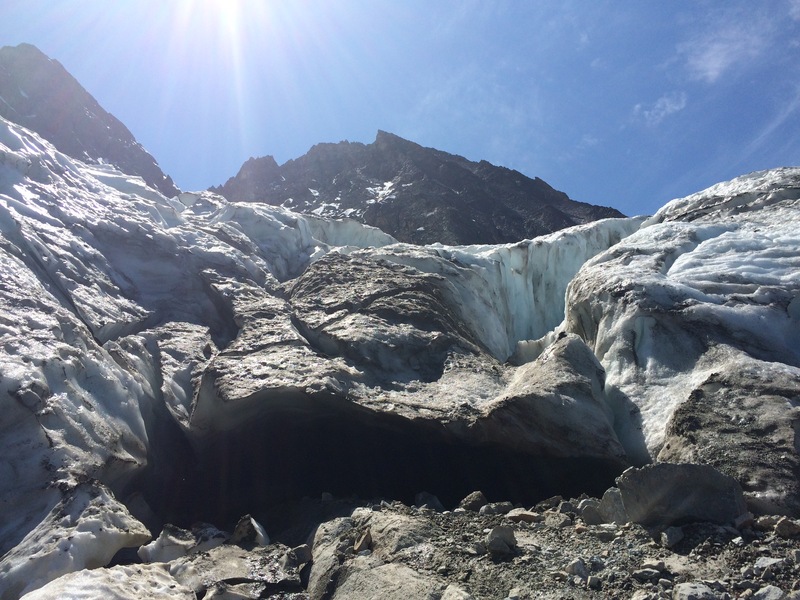 This entry was posted in Traveling, Wilderness and tagged backpacking, glaciers, patagonia, Torres del Paine on February 18, 2019 by sticker1. 8 years ago I read a trip report about Mt. Goode from my desk in Portland. It inspired me, and made me realize how much I had to learn about climbing. Other objectives lured me away over the years and the out of reach dream didn’t stick. I haven’t often really bit off more than I could chew in these climbing adventures, and there is only one way to fix that. “Car to car” typically means that you don’t carry sleeping gear- you just expect to be on the move no matter how long it takes. The risk of spending a cold night out is off-set by packs made lighter without sleeping gear. It is also a good way to guarantee an adventure. Running has always come naturally to me, and given that I’m nursing a shoulder injury, it makes more sense to combine long days and more moderate climbing to get my adventure fix. Doing the standard route on Mt. Goode car to car seemed like a laughably audacious goal. A 30 mile round trip with 3,000ft of gain on the approach, a glacier crossing, and a 3,000ft rock buttress? If I wanted to fail, at least I picked something worthwhile to fail at. I wasn’t so sure myself, so I picked a partner that has always inspired the best in me. In both climbing and life, Ky has shown me how to be stronger than I think I am- and he was just as game to find his endurance limit as I was. The goal was just to keep moving. This is a cool sign. But it was the wrong sign. We left Bellingham at 8pm, and got to sleep at 11pm. Up at 430a and jogging down the trail at 530a. There was already more than enough daylight. 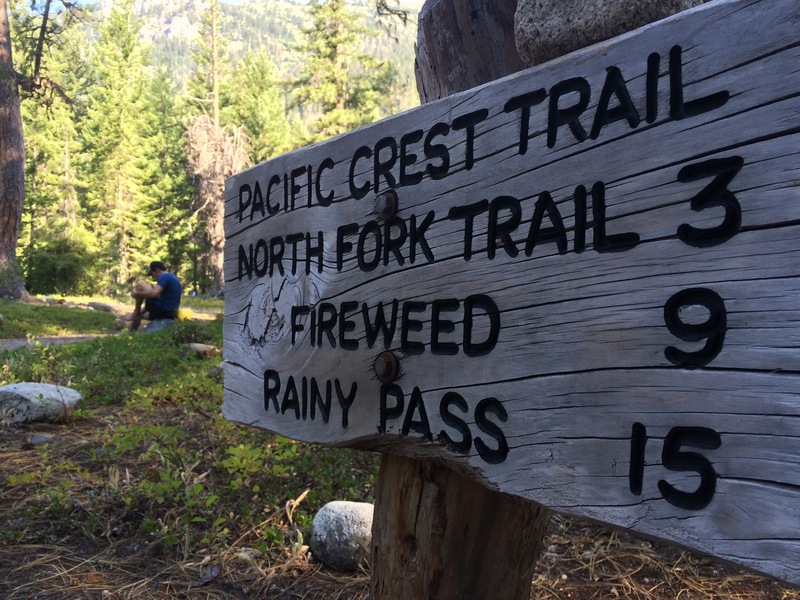 Confident, we raced the warming day until we reached the trail junction from the Pacific Crest down to Stehekin. We pounded a little food and I checked the map. Despite both reading the route description to each other while looking at the map, we had mistaken which trail led to the North Fork of Bridge Creek. Our elation from the fast travel faded into disdain for having added an extra 5.4 miles onto our already marathon day. Back to the previous junction and up the correct drainage. We continued to put down miles and race the heat. Due to the location of the route on the massif, you cannot see any of the route or approach until you are standing directly below it. The guidebook says “cross the creek, ascend the talus slope, and gain the glacier to access the bottom of the rock buttress.” Somehow, I think we both figured the 21 miles of approaching was the hard part, and we were wrong. Even from the creekbed 2,000ft below, just getting to the base of the cracked up, barren glacier was going to be the real adventure. We couldn’t bail without taking a look, so we slathered on some sunscreen and- kept moving. The east face baked as the clocked ticked past noon, then 1pm. 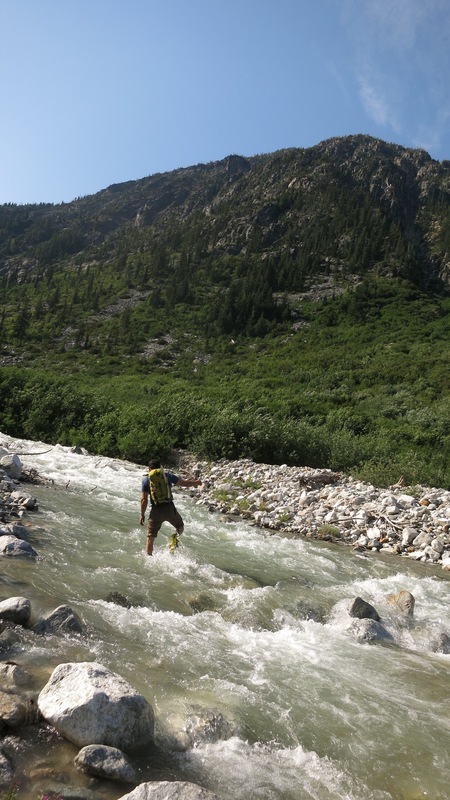 Slick granite slabs gave way to vertical bushwhacking through head-high alder. It got hotter as we climbed. Despite plenty of daylight, mid-afternoon is a terrible time to cross a glacier, especial one with many cracks and not much real snow. 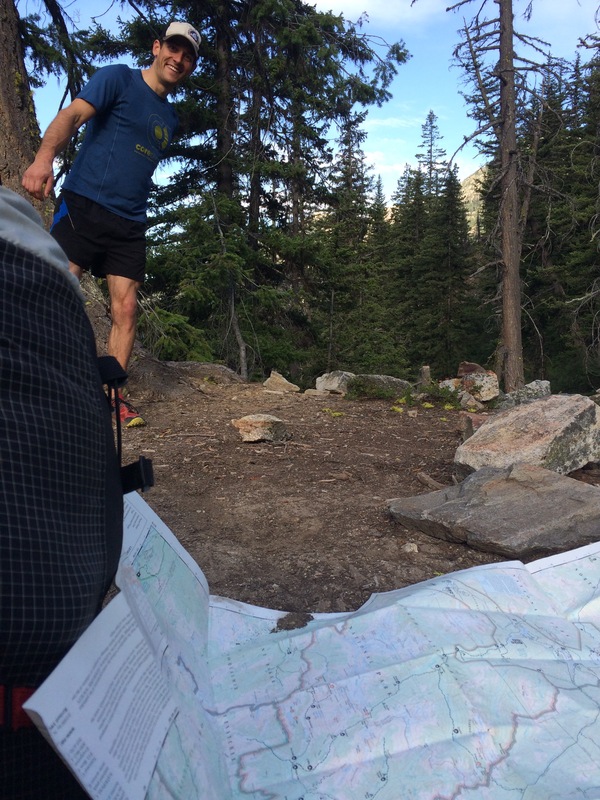 We found a single unlikely lead up about a 1/2 mile east of the rock route we were hoping for. Any remaining hope of rock climbing was instantly swallowed in the enormous, complex bergschrund crossing that guards the entire face. Worked and sunburned, downclimbing the approach was nothing to look forward to. 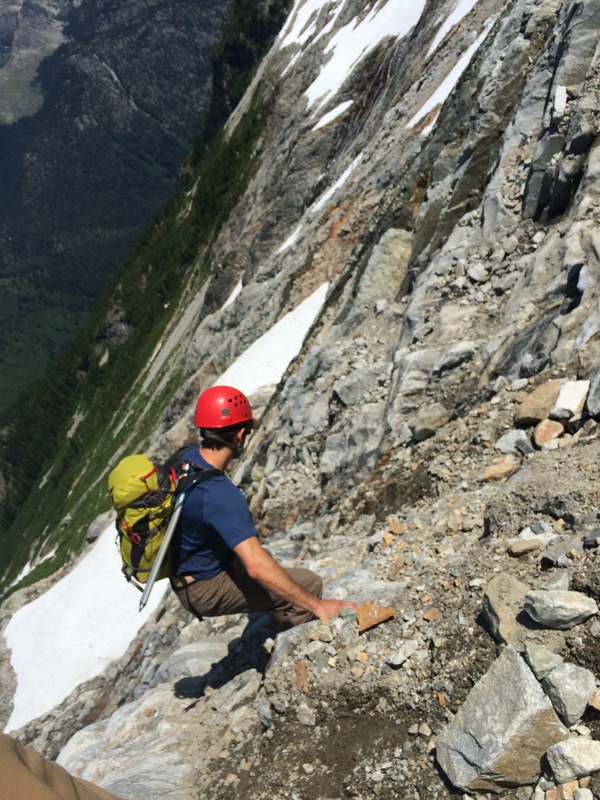 Shaky legs make downclimbing even spicier, and we started setting rappels as soon as we hit the lower granite slabs. Thank you to the others that have obviously done the same and left some rappel tat for us. Not the time nor place to rush. Our tiny rope set up gave us just enough to work with. We kept moving. River crossing, or foot icing? We made it back to the creek at 545p. Once on the trail, it was just a mental game to keep turning the legs over. Blood sugar dropped, blisters rose, and nightfall set in. We kept moving. It was a push to make the car, but that was the point. At 1045pm we tore into the maple bacon potato chips and sat heavily on the tailgate of Ky’s Subaru. Bailing didn’t honestly feel like much of a failure at all. We had covered 38 miles, used almost everything in our packs, and enjoyed an authentic Cascade experience. It was my longest day in the mountains to date, and I do think it’s possible to summit with a little better preparation and conditions. Many thanks to Ky for the amazing day out, and powering through the drive home so we could have cooked breakfast the next day- I couldn’t ask for a tougher, or better partner. 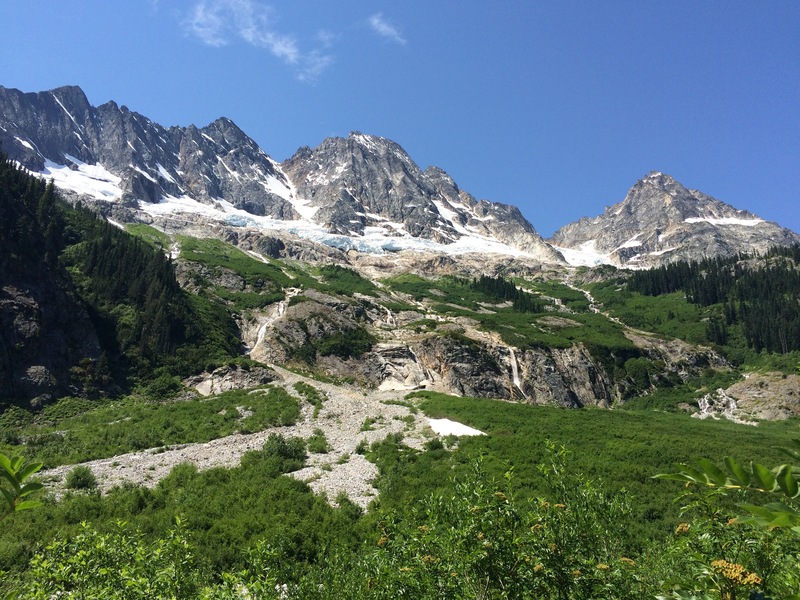 This entry was posted in Alpine Climbing, Running and tagged fast and light, glaciers, mt goode, north cascades national park, trail running, wrong turns on June 29, 2015 by sticker1.